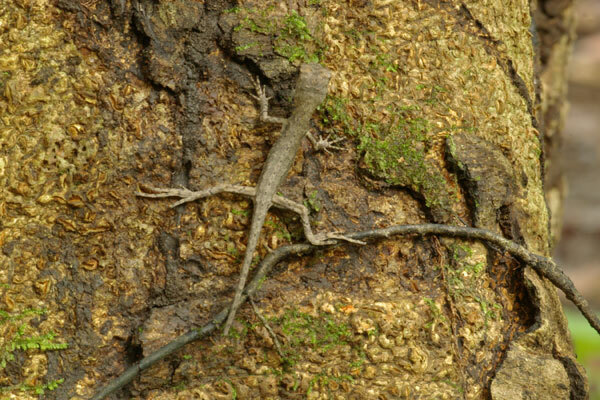 This was a wonderfully strange little lizard that my wife Monica spotted skittering around sideways on a large tree trunk like a long-leggedy spider. At first I thought it was an anole like others we had seen, but I soon realized that it had different proportions and a dramatically different style of movement. I still thought it was an anole, just some other type. After asking for identification help on fieldherpforum.com, I came to the conclusion that it was a tiny baby U. superciliosus. 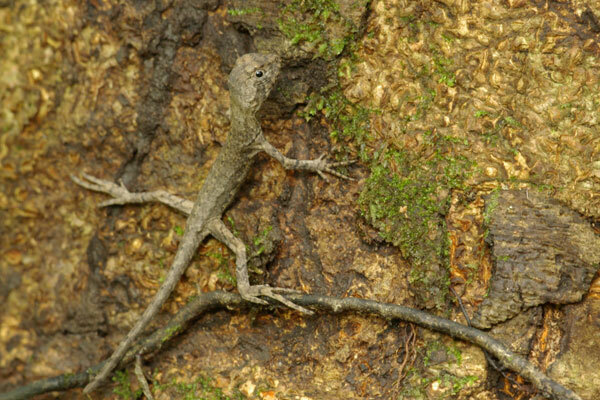 These lizards are called "Diving Lizards" because they dive into the water to escape danger. They're also called "Brown Tree-climbers" because they're brown, and climb trees (who would've guessed?). And most enjoyably they're called "Mop-headed Iguanas" because the adults have strange frills on their heads. They occupy a unique feeding niche — they mostly eat bugs, both living and dead, washed up along the shores of streams and rivers.